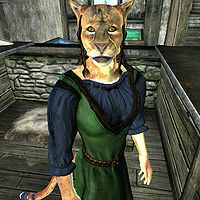 S'thasa is a Khajiit publican who runs the Border Watch Inn in the small settlement of Border Watch. She is a merchant who sells food and rents beds. She is also an avid collector of fine rare cheeses from all over Cyrodiil. Inside the Inn, you can see the cheeses in a little museum near the front door. They are all sealed in display cases with very hard locks. She stands behind the counter every day, offering her services from 4am until 10pm. Because most of the town's inhabitants visit the Inn to eat their daily meals, S'thasa has a pretty busy life, facing rush hours between 11am and 1pm and again in the evening from 7pm to 9pm. After a day of hard work, she goes to bed in one of the locked rooms at 10pm. The only exception to this routine is during the related quest, when she, as soon as you have fulfilled the three signs of K'sharra, will run around town in panic along with the rest of the village residents. She will continue to do so until you complete the quest, after which she will go back into the Inn, now offering her services in fear. She wields a leveled blunt weapon, and her regular bartending attire consists of a blue and green outfit along with a pair of quilted shoes. She also carries a pair of tan linens that she never wears because the outfit covers her legs. Additionally, S'thasa has a 25% chance of having leveled light armor - she may have all items except a cuirass. The armor is always the best possible quality for your level and may be enchanted at level three and above. The only time she wears this is while running around in panic during the related quest's later stages. Other than that, she carries the key to the display cases and a leveled amount of gold. Even when she welcomes you, her fascination with rare cheeses shines through: "Welcome to the Border Watch Inn. We don't get many visitors. Please feel free to stay a while. Take a seat, or feel free to look around. We have a fine collection of cheeses here, some of the rarest in all Tamriel!" And when you ask her for more information on the cheese collection, she will explain further: "It's been a hobby of mine for years. I've collected cheeses from all over Tamriel, including the rare Olroy cheese! A more pungent cheese you'll never find. It looks smooth, but it stinks to the heavens and beyond! I keep it locked away tight. If I were to try cooking with it, the smell alone would draw rats for miles! It's a lovely conversation piece, though." During the related quest, the town's shaman, Ri'Bassa, will also comment on the inn and her collection: "If you'd like to stay, I'd suggest getting a room at the Border Watch Inn. We don't get many visitors, but S'thasa serves a fine ale. She also has the finest collection of cheeses in the Empire! Her prized cheese has such a powerful aroma, she keeps it sealed in a case!" S'thasa is one of the few leveled merchants in the game, causing her to gain 1.5 points of Mercantile skill each time her level increases. Therefore, her Mercantile skill at any point in the game will be 30+(PC-1)*1.5. S'thasa is equipped with a high-quality blunt weapon (it is always of the best quality available for that level and is usually enchanted). If your Mercantile skill is at least 50, you can buy the weapon from her. Because it is not a merchant item, it does not automatically get respawned after three days. Instead, it is respawned every time your character levels up. This can be particularly advantageous at high levels, because she will sell enchanted glass, ebony, and daedric weapons (which usually are not available even unenchanted from merchants). Even though she is running around town in panic during the quest, you can still rent a room from her. Instead of going to bed at 10pm, she can get stuck in the western area of the Inn, near the big barrels. This can be solved by going outside, waiting for an hour and returning. Esta página foi modificada pela última vez à(s) 21h57min de 2 de novembro de 2013.